Tintin is now in the Pacific! Due to the problem with the antifouling we were delayed to the last transit of the World Arc Fleet. We left the marina at 3:00pm, anchored outside and awaited the 'advisors' who are on every boat through the canal to act as pilots. Our advisors for the 1st evening were Adrien and Hector. 30 years old and already a master mariner for unlimited size ships, he is training to be a pilot to spend more time with his young family. Extremely competent and great company, he made the process very easy. 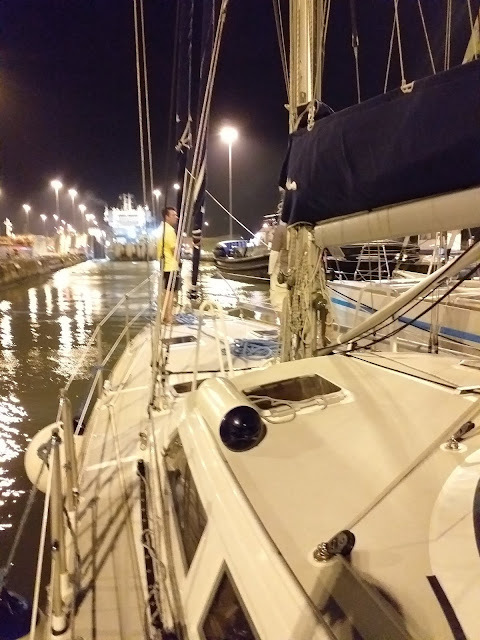 It took a couple of hours to slowly progress to the Gatun Locks, so it was dark when the action started. The glare of the lights made the atmosphere even more other-worldly. We were port side of a raft of 3 yachts. Aurora B on starboard and an imposing teutonic cat called Hanna in the middle. Line handlers ashore threw a heaving line down to each corner of the raft. This gets tied to our heavy lines and the raft was walked into the lock behind a big ship (a cable layer). The heavy lines are then hauled up and put around bollards and tied off. As water enters the lock, the lines are taken in to keep the raft central. Once the level equalised, the gates opened and we moved to the next stage. Gatun Locks consist of 2 sets of 3 chambers. It was about 9:30 when we exited the top chamber and moored close by the exit in the freshwater, crocadile-infested Gatun Lake. The next day, the advisors arrived early - in fact we were all still in pajamas as we started the the engine and cast off. We motored across Gatun Lake and then down Gaillaird cut (about 28 miles) to the Pacific locks. 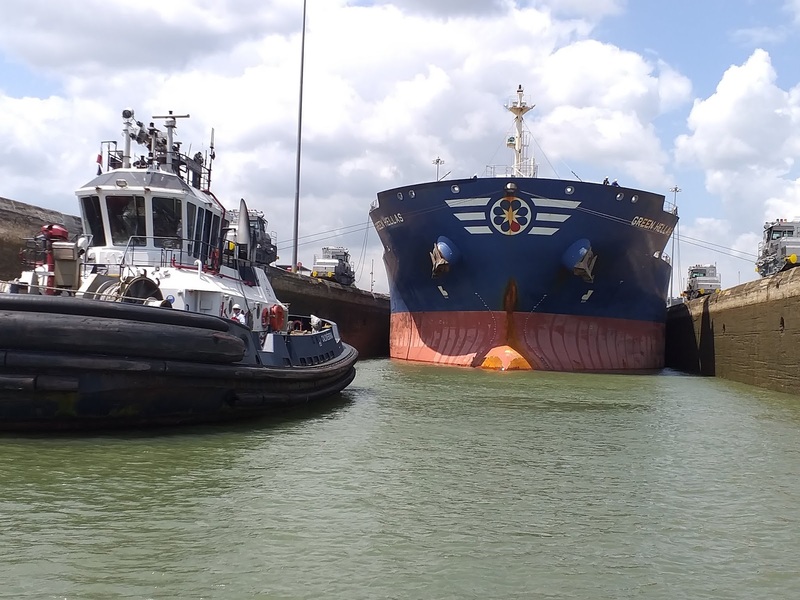 The Pacific side has 2 separate sets of locks - the Pedro Miguel lock and then 2 chambers of the Miraflores lock. Going down, we were at the front of the lock in front of a HUGE tanker. There were strong currents in the bottom lock as the seawater in the lock rushed under the freshwater and the raft slewed across the lock somewhat alarmingly (at least for Aurora B who needed the big fenders to keep the walls at bay). 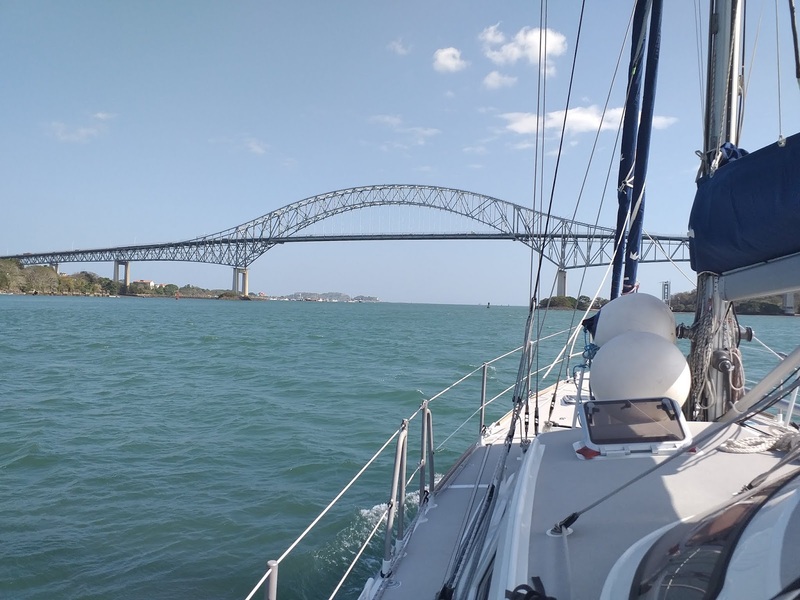 From the Miraflores lock, we unrafted and motored under the iconic 'Bridge of the Americas' into the Pacific Ocean. V Cool. You may have noticed that Richard and Nicki aren't in the pictures. There is a reason for that. While we waited for Tintin's bottom to be redone, they joined the crew of another WARC boat, Niobe, for their transit of the canal intending to drive back and join us for Tintin's transit. 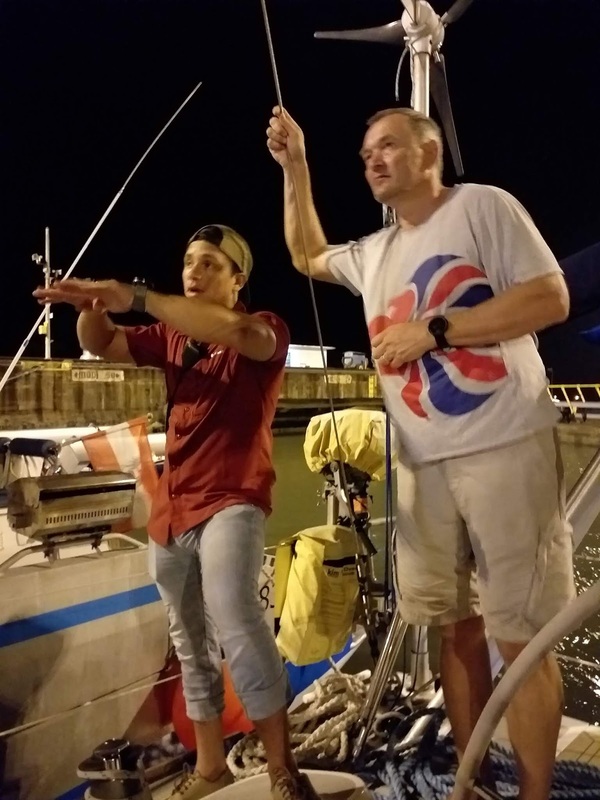 However, when mooring in the evening Richard tried to throw one of the big ropes and it got caught on a winch and wrenched his arm and ruptured the tendon of his bicep. This needs to have surgery and then 3 months rest, so very regretably they need to return to New Zealand to get it fixed. This is extremely disappointing for us, but especially for Richard and Nicki who will miss out on the trip. We are now in their hotel room as they do health and travel admin while we try to arrange additional crew.